Lush Hair I-Tip Hair Extensions Now In Stock! 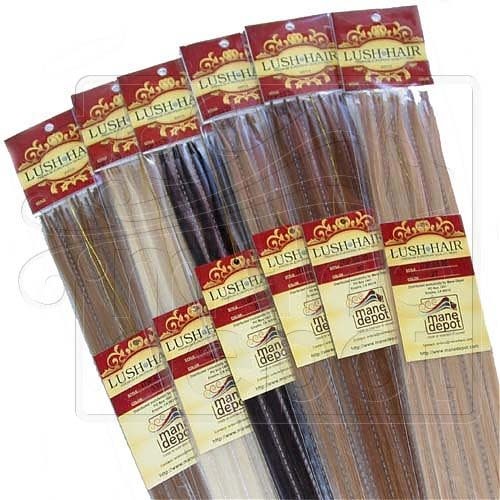 Lush Hair is our top of the line premium European quality strand hair extensions. After a full year of testing with a new manufacturer, we have developed the highest quality pretipped strands on the market today. I-tip hair extensions are also known as stick hair and shoelace hair because of their shape. They are installed individually with microrings, linkies, shrinkies and any other cold application method. Lush Hair I-tips can also be installed with fusion rebonds. Because you have complete control with color placement, creating highlights and lowlights is a breeze. Image the lightest blondes being as silky smooth and long lasting as the darkest browns. That’s Lush Hair! Our unique packaging places each strand in its own protective sleeve. No more tight banding around the tips that frequently bends and damages the prebonded tips. Every strand is individually wrapped and easily withdrawn from its sleeve. Strands not used remain in their packaging and are easily and safely stored for later use. Lush Hair is available in difficult to find ash tones as well as natural golden hues that reflect beautifully in sunlight. Pick up a Lush Hair Color Ring today and start experiencing the Lush Hair you’ve always dreamed of.